We are in the process of redesigning the 'sub-pages' of the Mini-ITX site, and as such the FAQ has not been updated much recently. Please bear with us and we will have a new-improved FAQ with you in a short(ish) while. 1.1. What is the Mini-ITX form factor? 1.3. What motherboards are currently available? 1.4. What connectors are available on the EPIA-800 and EPIA-5000 motherboards? 1.5. What jumpers are available on the EPIA-800 and EPIA-5000 motherboards? 1.6. What is the Eden architecture? 1.7. What applications best suit the Eden architecture? 1.8. What is the C3 architecture? 1.9. Was there ever an "ITX" form factor? 1.10. What if I want to upgrade my Mainboard or CPU? 1.11. What are the specifications of the CPU fan on the EPIA-800? 1.12. Will a 160GB drive work with my EPIA motherboard? 2.1. Can the EPIA platform run Linux/FreeBSD or any other x86 based Linux operating system? 2.2. Can the EPIA platform run Netware? 3.1. What Kernel parameters should I use for EPIA motherboards with Eden/C3 processors? 4.1. My Ethernet adapter refuses to work properly, or only works some of the time. 4.2. My 512MB DIMM isn't recognised, or refuses to work..
4.3. My system hangs regularly, or freezes during Windows/Linux installation. What is this site? Are you VIA? How do I get my project/news/supplier on the site? Can I buy any of this gear from you? Are you going to have any forums? Can I link to your site? Can I use your content? The maximum mainboard size is only 170mm x 170mm, where Flex/Micro-ATX can be much bigger. A Mini-ITX PSU is less than 100 Watts. Mini-ITX is backward-compatible with both Flex-ATX and Micro-ATX. 2 USB 1.1 ports. An optional 2 port USB 1.1 module may be connected to the motherboard. Further models have enhanced the capabilities of the boards, adding USB 2.0 and Firewire support, and the CLE266 Chipset. Other Mini-ITX Form Factor boards are available, including the Lucky Star Live 1000, running a fanless 667Mhz Eden ESP 6000 CPU. RCA Video or S/P DIF Port - dual function port provides either TV Out or 5.1 channel digital audio. An onboard jumper selects what the port is used for. S-Video Port - supports 640 x 480 and 800 x 600 in NTSC and PAL modes. 2 PCI IDE connectors - support Ultra DMA 33/66/100 modes. Both IDE1 and IDE2 can connect a master and a slave drive, allowing a maximum of 4 seperate devices. A DiskOn Module can be connected directly to one of the IDE connectors. PCI Slot - a PCI Riser Card module can be used for a 2 PCI slot solution. Compare the ratings above with recent Athlon CPU's that consume 70Watts! Due to the limited raw CPU power of the Eden CPU, certain tasks are not ideal candidates for the range. Audio/Video playback and Network Routing/Firewalling are ideal candidates, certain video codec's are unlikely to be viable. Dont expect to be able to compress video or play modern games at any great speed on an Eden based system. The Eden fills a niche normally taken by dedicated (and relatively expensive) embedded systems. The EPIA 800, M9000 and M10000 all use the Ezra-T core. There was an ITX form factor reference design, but no products have been released. 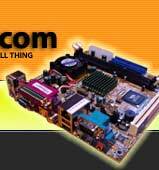 The ZIF (Zero Insertion Force) socket on most modern motherboards make up a significant part of the manufacture cost. The EPIA Mainboards currently available have an integrated CPU to reduce costs and streamline production. The drawback of this is the CPU and Mainboard form one unit and are not upgradable. 48 bit LBA is not supported on the first generation EPIA motherboards. The largest drive you will be able to attach is 136GB. Larger drives will be recognised as 136GB. EPIA M motherboards will support 48 bit LBA. One solution would be to use an IDE controller PCI card. The original EPIAs and EPIA Vs are very well supported under most recent kernels (EPIA 5000, EPIA 800, EPIA V5000, EPIA V8000). The EPIA Ms are less well supported (EPIA ME6000, M9000, M10000). Drivers exist in binary format only for MPEG2 acceleration, Sound and USB 2.0. Some distributions will have problems. Check this thread. Netware 5.1 will run on the EPIA platform. Netware 6.0 will not, as it requires the processor to report it has the PAE feature (Physical Address Extension) - this problem also exists with the Pentium M processor. Choose the Cyrix C3 processor type when compiling the Linux kernel. Also, be sure to include the VIA-Rhine network driver in the kernel or loadable module. First of all, update your BIOS. Do you still have the problem? The onboard Ethernet of EPIAs is often the first thing to stop working when there is not enough power getting to the board. It does not necessarily mean the Ethernet port is broken. Check your PSU is capable of supporting all your devices. With a 55W PSU there is only 4.58A to play with at 12V, but this is enough to support a board, hard drive, slimline drive and most PCI cards. If you have a full size CDROM on there too, you're drawing too much power! There *was* a problem with very early Morex Cubid 2677 cases (with a similar PSU), but Morex have fixed this problem. 4.2. My 512MB DIMM isn't recognised, or refuses to work. Update your BIOS to the latest version. Check you have compatible RAM - the EPIA motherboards can be rather picky. 4.4. I cannot get my EPIA M to display a picture on my TV after Windows has booted, even after selecting "TV" in the BIOS. The display output device on EPIA Ms running Windows is determined both by the BIOS *and* the software graphics driver. A Windows PC boots in standard VGA graphics mode, then the current graphics driver kicks in. Attach your TV and monitor together, select CRT+TV in your BIOS (update your BIOS if you do not have this option) and boot normally. Both screens will boot, then the TV will go black. Open the display control panel, click the settings tab, then advanced, then S3Display. Select the TV so that a blue line goes around it and tick the box next to it. Click 'Apply' and the TV will display again. Adjust your device settings appropriately. If you have another PC there is an easier option - install VNC as a service onto the EPIA M and adjust the control panel from this PC instead. 5.1. What is this site? Are you VIA? This site is a privately-run independent site focussing primarily, but not exclusively, on the Mini-ITX range of motherboards first proposed as a reference design by VIA at the end of 2001. We are NOT VIA. 5.2. How do I get my project/news/supplier on the site? 5.3. Do you carry advertising? 5.4. Can I buy any of this gear from you? 5.5. Why don't you answer my emails? It's nothing personal. We get a lot of them. Things can get very busy. 5.6. Are you going to have any forums? Yes, once we finish answering your emails. 5.7. How do I submit a project? We have a handy guide.. It's here. Please note that from August 25, 2003 we will only post original projects - i.e. projects not already on the web, that have not been submitted elsewhere. By submitting a project to us you are granting us exclusive use (though of course it still remains your property, and you may post it on your homepage). 5.8. Can I link to your site? Can I use your content? You may link to our site. Feel free to use a picture, but do not remove the logo, and copy it to your server first. You may quote small sections of text. If you like, you can use our logo - they are here. You may not reproduce projects on this site, partially or entirely (see note above), and you may not reproduce our content - it took us literally minutes to write (sometimes longer), and is of course our copyright. Instead, link to us. It's always nice if you tell us you are linking to us - we like to make new friends!